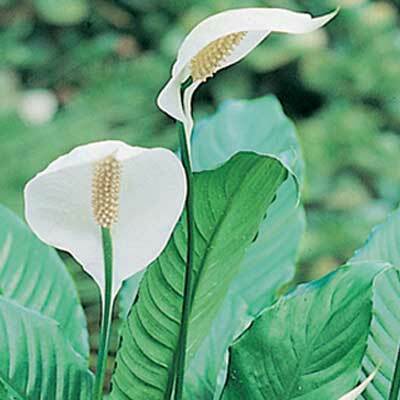 Spathiphyllum are used widely in gardens and homes. They are commonly called Peace Lilies or Madonna Lilies. For a plant that will take some neglect one must look at Spathiphyllums as a good choice. Flowers are always white and stately on the plants. Homes need greenery as our desire to be involved with nature is strong in all of us. Peace Lilies are so easy to grow for most home owners. As a potted plant in rooms in the home they are excellent needing little attention aside from watering regularly. Spathiphyllums in cultivation are native to the jungles of central and South America where they grow either in the ground or as epiphytes where the climate is wet enough. They are widespread in their native habitats.. Many hybrids have been developed over the years. The ones we have chosen are illustrated below.